2000년 전부터 약용으로 쓰인 본초에 대한 연구는 역사 속에서 꾸준히 증가하여 현재는 광물 등을 포함해 약 1만개 정도가 사용되고 있습니다. 현대본초의 연구는 현대과학과 한의학을 결합해 본초의 전통적 사용 방법을 설명하는 것 뿐만 아니라 새로운 조합과 사용법 등에 관한 연구로 발전하고 있습니다. 현대본초의 지식은 전통한의학과 만나, 보다 효과적이고 안전한 치료를 달성하는 데 도움이 될 것으로 생각합니다. 본초에 대한 지식은 오래전부터 꾸준히 발전했습니다. 그러나 현재는 과학적 연구 방법을 통해, 과거와는 다른 형태로 발전하고 있습니다. 칼럼을 통해 현대본초라는 이름으로 본초의 현대과학적 연구, 새로운 제형, 배오 등에 관한 지식을 전하고자 합니다. 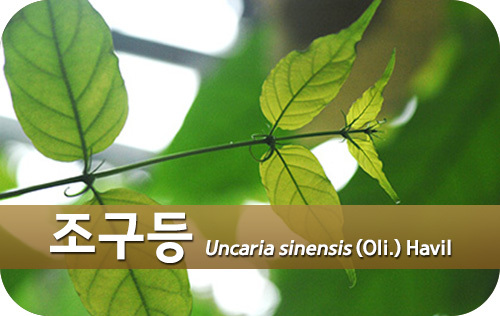 조구등은 꼭두서니과 (Rubiaceae) 구등속 (Uncaria genus) 화구등 (Uncaria sinensis (Oli.) Havil) 및 기타 동속 근연식물의 가시가 달린 어린 가지이다. 중국은 구등 (U. rhynchophylla(Miq.) Miq. ex Havil), 대엽구등 (U. macrophylla Wall), 모구등 (U. hirsuta Havil. ), 화구등, 무병과구등 (U. sessilifructus Roxb. )의 가지를 구등으로 사용한다. 조구등은 두통, 고혈압, 부정맥, 전간 등의 치료에 사용된다. 송대 <보제본사방 普济本事方>에 기록되어 있으며, 천마구등음, 조등산, 구등음 등 구등을 함유한 처방이 고혈압과 전간에 사용되었다 . 조구등을 함유한 처방 중 억간산이 일본에서 활발하게 연구되었는데, 억간산은 명대 설개 (薛鎧)가 편찬하고 아들 설기 (薛己)가 증보하여 1555년 간행된 <보영촬요 保嬰撮要>를 출전으로 한다. 원래 소아를 위해 만들어졌으나, 어머니가 복용하면 좋다고도 기록되어 있으며 다양한 정신과 질환에 사용된다. 인돌 알칼로이드 (indole alkaloid) 성분이 구등의 주요 활성 성분이다. 특히 구등에 존재하는 tetracyclic oxindole alkaloids가 중추신경계에 주로 작용하며, 여기에는 rhynchophylline, isorhynchophylline 성분 등이 해당된다 . 구등은 알칼로이드를 약 0.2% 함유하고 있으며, 이 중 rhynchophylline가 28-50%를 차지하고, isorhynchophylline는 약 15%를 차지한다 . rhynchophylline 성분은 심혈관계, 중추신경계 및 기타 약리작용을 보고한다. 1978년 Zhou J 등의 연구에서 항고혈압 작용이 관찰되었으며, 혈관내피 비의존 Ca2+ 경로를 통해 혈관이완 작용을 보인다. 또한 in vivo 및 in vitro 실험에서 심박증가를 억제하고, 심근의 산소소비를 감소시켰다 . 중추신경계에서 rhynchophylline 성분은 가벼운 진정 작용, 항치매, 항전간, 건망증의 완화, 대뇌허혈의 보호, 항저산소, 항약물중독, NMDA 수용체의 비경쟁적 길항제, 중추신경전달물질의 조절 작용을 보였다. 또한 항응고, 혈관평활근 세포증식의 억제 작용도 보고된다 . isorhynchophylline 성분은 항고혈압과 신경보호 활성으로 최근 관심을 끌고 있는데, 주로 고혈압, 서맥 (brachycardia), 부정맥, 혈관성 치매, 건망증과 같은 심혈관계와 중추신경계에 대한 작용을 나타낸다 . GM 성분은 치매의 행동심리증상 (BPSD) 중 공격성에 대한 효과 성분으로 시사된다 . rats를 대상으로 한 실험에서 억간산의 공격성 완화 작용은 조구등의 제거로 완벽하게 소실되었으며, 조구등 단일 복용에서도 공격성이 약화되고 사회적 행동이 촉진되었다 . 한약을 경구 복용하여 중추신경계에 작용하기 위해서는 B.B.B.를 통과해야 한다. 이에 대해 in vivo, in vitro 연구에서 GM 성분은 rats의 B.B.B.를 통과하여 뇌에 작용함을 보고하였다 . 특히 전두엽에서 상대적으로 높은 친화도 (affinity)를 보였으며, dorsal raphe nucleus (DR)에서는 중등도의 친화도를 나타냈다 . in vivo, in vitro 연구에서 GM은 5-HT1A, 5-HT2A, 5-HT2C 및 5-HT7 수용체에 길항 작용이 있음이 시사되었다 [5,7,8]. 이 외에도 GM은 실험에서 glutamate 유도 신경독성을 억제했으며, 세포 내 ROS 축적을 억제했다 . 구등과 천마를 배오한 처방은 대뇌피질의 지질과산화 레벨을 억제했다. 또한 SOD 조기 활성 및 자유라디칼 제거 작용을 나타냈다 . <중국약전>에서 조구등은 주로 심혈관계 특히 고혈압 치료에 사용되었다. 최근 혈관이완 작용에 가장 효과적인 용매를 찾는 실험에서 조구등의 95% 에탄올 추출물이 가장 높은 효과를 보였다 . 조구등은 내피의존적인 NO 경로 와 비의존적인 전압의존 칼슘 채널 차단 의 기전으로 혈관 확장 효과를 나타낸다. 구등에서 분리한 hirsutine 성분은 aconitine (mice)과 ouabain (guinea pigs)로 유도된 부정맥에서 항부정맥 효과를 보였다. 이 연구에서 hirsutine 성분의 β-adrenoceptor 차단 작용은 없다고 밝혀졌다 . 이후 K+에 대한 작용 평가에서 rhyncophylline 성분의 부분적인 K+ 채널 억제 효과가 시사되었다 . PLCγ1 (phospholipase Cγ1)는 사람 암세포의 증식과 진행에 중요한 역할을 하는데 구등의 CHCl3 추출물 (250ug/mL)은 PLCγ1을 35.4% 억제했다 . 구등 메탄올 추출물은 에탄올 유도 래트의 지연 (latency)을 감소시켰다. 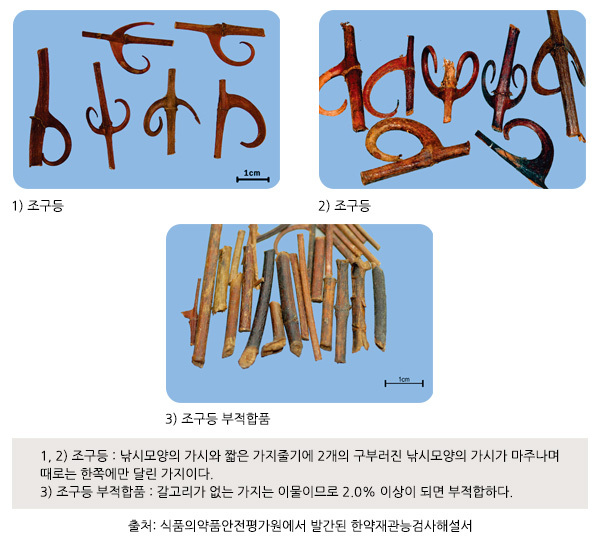 신경전달물질 분석에서 도파민 활성, 5-HT 및 glutamic acid의 억제 작용을 나타냈다 . 몇몇 연구들에서 rhynchophylline과 iso-rhynchophylline 및 GM이 5-HT 수용체에 길항 작용을 보고한다 . 구등의 물과 알콜 추출물은 신경보호 및 항경련 작용이 확인된다 . 생쥐에게 인돌 알칼로이드 등의 성분을 경구 투여 후 운동 활성 저하가 나타났다. 이는 중추 도파민 경로 매개로 시사된다 . 또한 천마와 구등의 배오 처방은 항산화 및 자유라디칼 제거를 통한 항전간 효과를 보였다 . 한편 kainic acid 처치 rats 모델 연구에서 구등만이 지질과산화를 억제했으며, 천마를 배오할 경우 추가 시너지 효과가 없었음을 확인했다. 그러나 배오에 의해 wet dog shakes (WDS)가 추가 지연되어, 항경련의 시너지는 확인할 수 있었다 . 또한 항경련에서 천마와 구등의 배오 [10,17] 및 항고혈압에서 구등과 우슬의 배오에 대한 실험연구가 보고된다. 이외에도 구등의 파킨슨병, 알츠하이머병  및 뇌세포 보호 [18-21] 관련 약리작용이 실험적으로 보고되었다. <중국약전>에 따르면, 전통적으로 구등의 용량은 50-250mg/kg이 추천된다 . 조구등을 함유한 억간산의 경우 드물게 피로 및 과다진정 (oversedation 또는 drowsiness) 작용이 유발된다. 이는 조구등에 의한 부작용으로 추측된다 . Zhang Q, Zhao JJ, Xu J, Feng F, Qu W. Medicinal uses, phytochemistry and pharmacology of the genus Uncaria. J Ethnopharmacol. 2015 Jun 17. pii: S0378-8741(15)00419-5. doi: 10.1016/j.jep.2015.06.011. Zhou J, Zhou S. Antihypertensive and neuroprotective activities of rhynchophylline: the role of rhynchophylline in neurotransmission and ion channel activity. J Ethnopharmacol. 2010 Oct 28;132(1):15-27. doi: 10.1016/j.jep.2010.08.041. Zhou JY, Zhou SW. Isorhynchophylline: A plant alkaloid with therapeutic potential for cardiovascular and central nervous system diseases. Fitoterapia. 2012 Jun;83(4):617-26. doi: 10.1016/j.fitote.2012.02.010. Mizoguchi K, Kushida H, Kanno H, Igarashi Y, Nishimura H, Ikarashi Y, Kase Y. Specific binding and characteristics of geissoschizine methyl ether, an indole alkaloid of Uncaria Hook, in the rat brain. J Ethnopharmacol. 2014 Dec 2;158 Pt A:264-70. doi: 10.1016/j.jep.2014.10.015. Ikarashi Y, Mizoguchi K. Neuropharmacological efficacy of the traditional Japanese Kampo medicine yokukansan and its active ingredients. Pharmacol Ther. 2016 Oct;166:84-95. doi: 10.1016/j.pharmthera.2016.06.018. Imamura S, Tabuchi M, Kushida H, Nishi A, Kanno H, Yamaguchi T, Sekiguchi K, Ikarashi Y, Kase Y. The blood-brain barrier permeability of geissoschizine methyl ether in Uncaria hook, a galenical constituent of the traditional Japanese medicine yokukansan. Cell Mol Neurobiol. 2011 Jul;31(5):787-93. doi: 10.1007/s10571-011-9676-3. Pengsuparp T, Indra B, Nakagawasai O, Tadano T, Mimaki Y, Sashida Y, Ohizumi Y, Kisara K. Pharmacological studies of geissoschizine methyl ether, isolated from Uncaria sinensis Oliv., in the central nervous system. Eur J Pharmacol. 2001 Aug 17;425(3):211-8. Ueda T, Ugawa S, Ishida Y, Shimada S. Geissoschizine methyl ether has third-generation antipsychotic-like actions at the dopamine and serotonin receptors. Eur J Pharmacol. 2011 Dec 5;671(1-3):79-86. doi: 10.1016/j.ejphar.2011.09.007. Sun J, Ren X, Qi W, Yuan D, Simpkins JW. Geissoschizine methyl ether protects oxidative stress-mediated cytotoxicity in neurons through the 'Neuronal Warburg Effect'. J Ethnopharmacol. 2016 Jul 1;187:249-58. doi: 10.1016/j.jep.2016.04.034. Liu J, Mori A. Antioxidant and free radical scavenging activities of Gastrodia elata Bl. and Uncaria rhynchophylla (Miq.) Jacks. Neuropharmacology. 1992 Dec;31(12):1287-98. Loh YC, Ch'ng YS, Tan CS, Ahmad M, Asmawi MZ, Yam MF. Mechanisms of Action of Uncaria rhynchophylla Ethanolic Extract for Its Vasodilatory Effects. J Med Food. 2017 Sep;20(9):895-911. doi: 10.1089/jmf.2016.3804. Kuramochi T, Chu J, Suga T. Gou-teng (from Uncaria rhynchophylla Miquel)-induced endothelium-dependent and -independent relaxations in the isolated rat aorta. Life Sci. 1994;54(26):2061-9. Horie S, Yano S, Aimi N, Sakai S, Watanabe K. Effects of hirsutine, an antihypertensive indole alkaloid from Uncaria rhynchophylla, on intracellular calcium in rat thoracic aorta. Life Sci. 1992;50(7):491-8. Ozaki Y. Pharmacological studies of indole alkaloids obtained from domestic plants, Uncaria rhynchophylla Miq. and Amsonia elliptica Roem. et Schult. Nihon Yakurigaku Zasshi. 1989 Jul;94(1):17-26. Wang XL, Zhang LM, Hua Z. Effect of rhyncophylline on potassium channels in isolated rat or guinea pig ventricular myocytes. Yao Xue Xue Bao. 1994;29(1):9-14. Sakakibara I, Terabayashi S, Kubo M, Higuchi M, Komatsu Y, Okada M, Taki K, Kamei J. Effect on locomotion of indole alkaloids from the hooks of uncaria plants. Phytomedicine. 1999 Jul;6(3):163-8. Hsieh CL, Tang NY, Chiang SY, Hsieh CT, Lin JG. Anticonvulsive and free radical scavenging actions of two herbs, Uncaria rhynchophylla (MIQ) Jack and Gastrodia elata Bl., in kainic acid-treated rats. Life Sci. 1999;65(20):2071-82. Shimada Y, Goto H, Itoh T, Sakakibara I, Kubo M, Sasaki H, Terasawa K. Evaluation of the protective effects of alkaloids isolated from the hooks and stems of Uncaria sinensis on glutamate-induced neuronal death in cultured cerebellar granule cells from rats. J Pharm Pharmacol. 1999 Jun;51(6):715-22. Kang BK, Kim MK, Kim SY, Lee SJ, Choi YW, Choi BT, Shin HK. Anti-Neuroinflammatory Effects of Uncaria sinensis in LPS-Stimulated BV2 Microglia Cells and Focal Cerebral Ischemic Mice. Am J Chin Med. 2015;43(6):1099-115. doi: 10.1142/S0192415X15500639. Seo HB, Kang BK, Kim JH, Choi YW, Hong JW, Choi BT, Shin HK. Partially purified components of Uncaria sinensis attenuate blood brain barrier disruption after ischemic brain injury in mice. BMC Complement Altern Med. 2015 May 27;15:157. doi: 10.1186/s12906-015-0678-4. Xian JW, Choi AY, Lau CB, Leung WN, Ng CF, Chan CW. Gastrodia and Uncaria (tianma gouteng) water extract exerts antioxidative and antiapoptotic effects against cerebral ischemia in vitro and in vivo. Chin Med. 2016 May 31;11:27. doi: 10.1186/s13020-016-0097-6. Okamoto H, Iyo M, Ueda K, Han C, Hirasaki Y, Namiki T. Yokukan-san: a review of the evidence for use of this Kampo herbal formula in dementia and psychiatric conditions. Neuropsychiatr Dis Treat. 2014 Sep 12;10:1727-42. doi: 10.2147/NDT.S65257.